Dr. Paul Dougherty - See For YourselfDr. Paul Dougherty – See For Yourself | Dr. Paul Dougherty, M.D. Dr. Paul Dougherty asks...If you look at life through glasses of contact lenses, or if your vision is blurry, this book will open your eyes to some wonderful possibilities. Dr. Paul Dougherty, MD, is one of the world's preeminent vision correction surgeons, and the innovator of the breakthrough Vista Vision ICL technology. With that foundation, Dr. Paul Dougherty clearly lays out options for vision correction so anyone can begin to make informed choices on what will serve them best. Receive news, updates, and events by email. 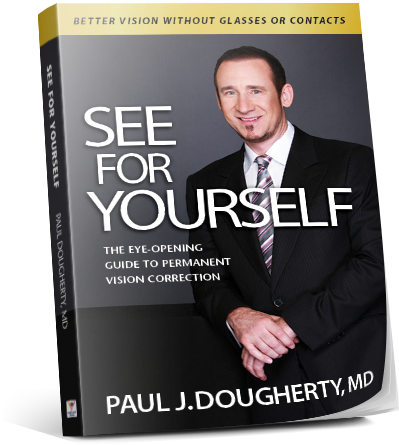 Dr. Paul Dougherty is one of our country’s leading pioneers in advanced vision correction surgery. He has helped to develop many lens and laser-based vision correction technologies that have revolutionized his field, often travelling the globe training refractive surgeons in those techniques. His Southern California-based Dougherty Laser Vision is considered a major center for clinical research involving the latest innovations in refractive surgery. Dr. Paul Dougherty devotes a great deal of time to volunteer work, improving the vision of countless impoverished and deserving people across the United States and around the world. Copyright © 2017 Paul Dougherty, MD All Rights Reserved.